All my referrals are insured automatically till the insurance is active. Check the counter next to name of the projects on the main monitor. 5) how easy to hide some big requests and pay just low amounts to keep the rate high? If you can't see any trace of older compensations, do not believe that the site is serious. Non transparent work - cheating. So here you are in the best place where each investor counts! Of course you can use RCB service as well, there is no limitation. You do not have to pay nothing to be compensated. You can use all services even without registration. ISA must be the first an only upline, changing uplines to get better conditions is not fair. No compounding is allowed while the insurance is active. You must withdraw all available money daily from your balance during this period. Few missed days are acceptable(2-3), but these amounts will be counted as withdrawn. Fast projects - A1D "after1day": the longest plan to choose is 5-days plan. You can choose longer plans, but the risk is purely yours. Projects with DAILY plans - but if you choose any "after-plan": I will deduct daily earnings from the claimed amount based on the highest daily investment plan valid for your deposit. The longest "after-plan" in this category is max 15-days. Choosing "after-plan" is risky and greedy choice and it is absolutely not fair with other solid investors. The maximal coverage is 150$ per user. Of course you can deposit more, but only this limit will be taken into calculation. The limit can be sometimes different depending on volume of amount, requests, market circumstances. The limit is always published if it does not equal to 150$. Payza investors are entitled to get just 50% of final rate, since they are using Payza only for its refund policy, and double refund is not fair at all. Note, you can't claim compensation from me to your Payza wallet. I burned my fingers more times and I do not recommend to use Payza in general. It is tricky and the most expensive e-wallet with slow support. I can't cover those investments which were made once the project has been moved to OnHold or Scam sections with Problem or Not paying status. I recommend to check the status of the project on ISA before you invest. You can choose any e-wallet to be paid (excluding not typical ones like Paypal, Skrill, etc.). There is a 3% exchange fee if it is not the source currency. BTC investments: you have to describe all transactions in USD, excluding "btc-only" projects. Use the rate of BTC when you invested (or claimed RCB). This course must be used for withdrawals as well. You can't use different courses to earn arbitrage. All investments are counted per investor, not just the last one. Upline-change is not possible, it is not about searching benefits if a better upline appears. You must provide correct login details if the site is online. If it went offline, screenshots became mandatory, at least from e-wallets. Here you can create a filter to show withdrawals as well. Referral commissions below $20 won't be deducted from the claimed amount. Above $20 it is stated as earnings and will be deducted if you can't provide proofs that referral commissions were returned to investors as RCB. 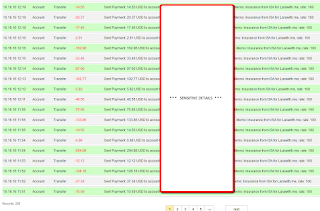 The list of compensation requests becomes visible after 3 days once all requests are checked. Then you have min. 12h to ask me if you have any issue with your request. Follow the news for actual instructions if you are not sure. The time has better value than the money, so place your request just once, but more carefully. Our time is as valuable as yours. Save ours and we will save yours. THE RATE of compensation depends on volume of correct requests and deposited amounts. Please do not think that all investors are insured up to 2000$. 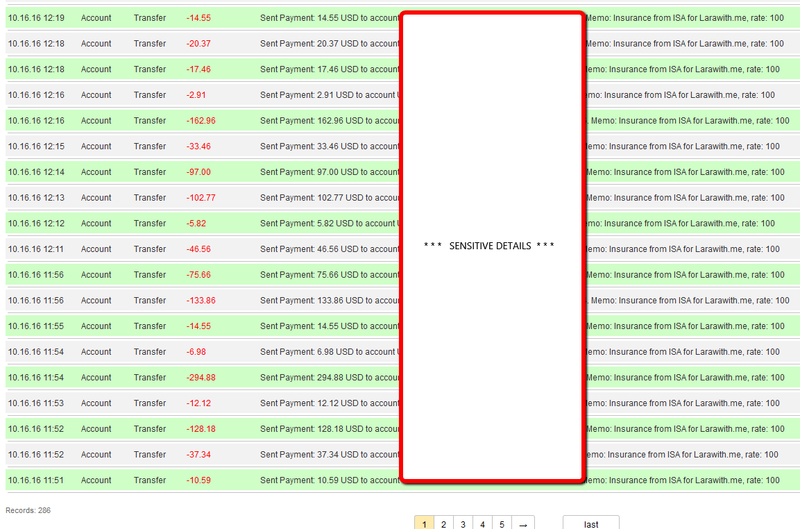 If I have 100 active referrals, each with 2000$ deposit, do you believe that is there any admin who gave me 200k in advance to cover everything? 2000$ (or equivalent amount) is all the money to share. Insurance is not a guarantee how to make profit, but you can get some money back in the worst situation. By other words you can avoid 100% loss in insured projects till the insurance is active. Please note, there are more important factors why to invest than the insurance. Be smart and try to get extra background information, search for something outstanding and if your 6th sense says YES, then the insurance won't be needed at all. Do not invest in any project just because it's new and insured, it's a really serious advice. Only through the official form below this text, you can see it just while it is active. If you can't see it, you should know that I require login details and screenshots so do not be surprised when you start to fill it out at such event. Please provide all required details correctly within 3 days till the form is active. Providing all details on time and correctly is absolutely your responsibility. The insurance form is active just for 3 days and disappears automatically. Then I publish the accepted requests here and all requests on the forum, where you can see the reasons as well if the requests are wrong. Of course it is published in news, please follow. You will have min. 12 hours (usually a day) to contact me if you have any issue. Then I make the calculation and share the insurance. Once the insurance is shared, there is no further chance to accept more requests. Mac94q 75 22.15 3 49.85 43.61 ? Note, 5000% after 90days or similar plans are not covered. If you give wrong login details then do not wonder that you can't find your request on the table above. Also, do not spend your and our time once you are in profit based on previous investments. All investments are counted, not just the last one. 1240$ BTC price is used to reflect the reality (600$ was just a fixed rate to avoid fluctuation). Color code: invalid login details. Next time such compensation requests won't be listed. color code: no screenshot, "thanks for your help"
Marckeem 100 8.4 4 no proof nor login details provided within 3 days, just when everything was ready to start sharing (even I answered him 2 times). Strange, but DECLINED. the general rate would have been higher. As a result some selected investors got gift from me. 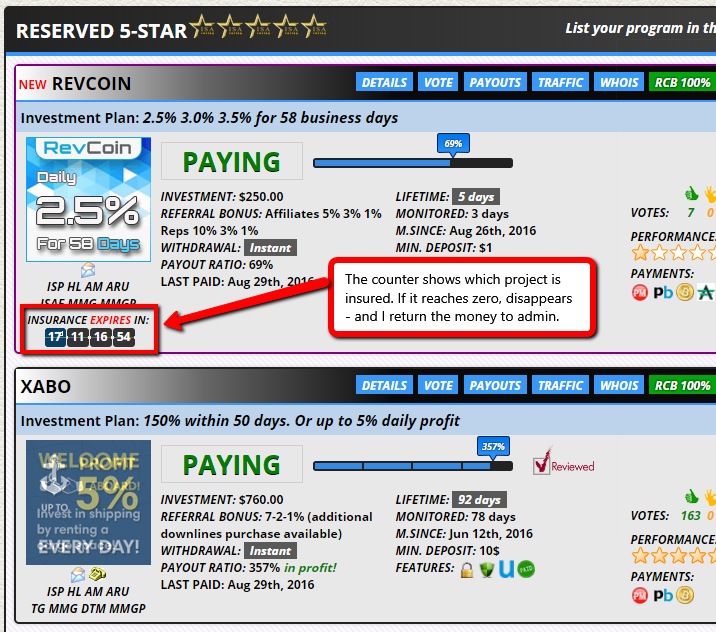 Nov/15 Premium Arbitgo scoin 40 0 0 40 17.76 PM?